Overview : Easily control the next generation of home entertainment with the Blue-Wave Remote from Nyko. The Blu Wave allows you to easily control the playback of Blu-Ray movies, DVDs and CDs on the PlayStation 3 console. Utilizing infrared technology, the Blue Wave can navigate system and movie menus, skip chapters or tracks, pause and play a movie or music and replicate other PlayStation 3 controller functionality from up to 25 feet away. The compact USB IR receiver plugs into any open USB port for easy set up requiring no complicate software, pairing or programming. The Blue Wave is powered by 2 AA batteries (included). Quality/Usability : The PlayStation 3 has a built-in Blu-Ray DVD player but in order to use the menus and to control the PS3, you'll either have to use the SIXAXIS controller or Sony's Blu-Ray DVD Remote, both of which work with the PlayStation 3 via bluetooth. 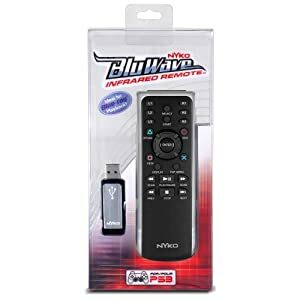 Like always, there will always be cheaper alternatives from 3rd party manufacturers such as the Nyko BluWave Infrared Remote, which retails for just $20. The Blu-Wave includes a USB dongle, which acts as a infrared receiver and the Blu-Wave infrared remote. To match the PS3's look and to be consistent, the Blu-Wave is black with silver outlining. Included are two AAA batteries which are included. The remote itself feels very good in the hands. The remote is exactly like the PlayStation 3 SIXAXIS controller but without the motion and with a remote design. Along with the standard PS3 controllers such as square, triangle, X and circle, Nyko added some shortcuts for easier access such as fast-fowards, rewind, play, pause, display, chapter advance and many more simlar to that of what you would find on a DVD remote. Setup is fairly easy. Simply just plug in the dongle into any of the consoles USB ports. The moment you plug it in, it should work immediately. Just like you would with a PC plug-n-play. The Blu-Wave remote worked perfectly both with DVD and Blu-Ray movies. All features worked perfectly but I did notice that while existing to the PS3's menu, there was a slight delay or lag. This doesnt happen with the SIXAXIS controller. I was informed that since Nyko uses a proprietary code, that if you have a universal remote, you can set that remote to work with the PS3 and the infrared dongle. This will eliminate having an extra remote laying around. It would have been nice if the remote allowed you to turn ON and OFF the PlayStation 3 but you cant. Conclusion : Overall, the Nyko Blu-Wave Infrared Remote works great and as it should. It would of been nice if the remote was able to turn ON and OFF the PlayStation 3 and be able to eject discs. The ability to use a universal remote with the dongle to eliminate having an extra remote laying around is great.